The combination of deicing salts and chemicals causes billions of dollars in damage every year to masonry and concrete sidewalks, driveways, patios, and pool areas. 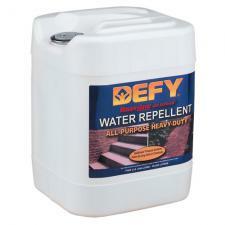 Defy water repellent allows deep penetration of its active ingredients to form a strong chemical bond beneath the treated surface. This bond allows it to become a physical part of the structure, providing long-term water repellent protection. Defy will not alter surface color or appearance. 7 year warranty. 5 gallon container. Average coverage is 100 - 150 sq. ft. per gallon.